I had a recent conversation with a gentleman at the local occult supply shop, and discovered the reasons behind the shortage of black copal that we are currently experiencing. Black copal, the resin of the shrublike Bursera Odorata tree, has always been in somewhat short supply because its source tree is at risk due to overharvesting and deforestation. But now, add to these troubles actual attacks on the resin-gatherers by cartels in the region who wish to have complete control over the local economy. In short, people are out there literally risking their necks to provide for our offering altars. 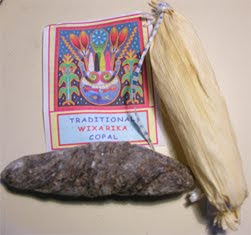 A Black Copal "tortilla" wrapped in cornhusk. This is another case where you really have to think about the context of your shamanic practice and offering. It is important to understand not just the traditional use and significance of the offering your choose to make, but also where it comes from. Whether it is decade-seasoned palo santo wood or copal “tortillas” gathered with prayer, each offering has a story that did not begin with when we paid or traded for it. If you use copal of any color, save a portion of your prayers for those who have gathered it—especially those who are now endangered for doing so.